Tite is not too concerned by the disappointing performance. 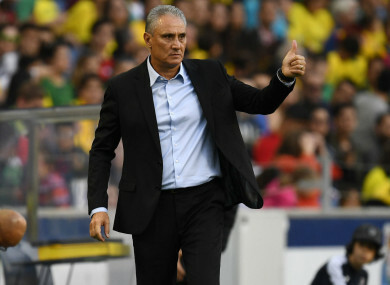 BRAZIL COACH TITE urged supporters to not panic after Saturday’s embarrassing 1-1 draw with Panama, adamant a drop in standard is “normal” when young players are given opportunities. “What do we establish at this stage now? We gave young people opportunities,” Tite told reporters. “It was a bad result, and the first half was below our expectations. After half-time there were some adjustments we made. At the interval we were able to reorganise and we then went to a level of normality, but the first half was below expectations. “It’s normal. Today we had a defensive line with [Eder] Militao and [Alex] Telles. This is the stage we are in. “When we go to the Copa America, then I make the best choices. My expectation was to be a bit more creative, but I also have to accept that the midfield is going to make errors. “I have to make these modifications so that the game can have a creative process with the forwards. The supporters are there to listen, to understand, to be annoyed by the result. Normally that’s the way it is. “If I am a fan, I want to win against Panama. We have to understand the context, just as we have to understand the construction of the team. Email “Brazil boss refusing to panic after woeful Panama draw”. Feedback on “Brazil boss refusing to panic after woeful Panama draw”.